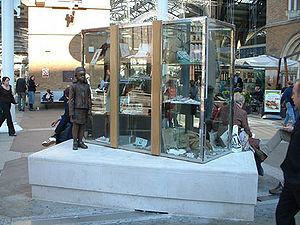 This year marks the 75th anniversary of the Kindertransport. In November 1938, after Kristallnacht demonstrated clearly to any doubters that Jews in Germany and Austria were in real danger, Parliament agreed to allow unaccompanied children to enter the country, under certain conditions, and with financial support from refugee organisations. An appeal was put out for foster parents here, and in Germany and Austria a network of organisers worked to identify priority cases, and to get the necessary paperwork. The children could bring with them only a small suitcase, in which many parents placed photographs or other keepsakes along with more prosaic items. Between December 1938 and May 1940, 10,000 unaccompanied children, mainly Jewish, arrived in Britain. As the danger spread, Czech and Polish children were helped too. They went by train to the Netherlands, and then crossed the Channel by ferry before taking another train to Liverpool Street station where most were met by their foster families. The last group of children left Germany on 1 September 1939. A party left Prague on 3 September 1939 but was sent back. The last boat transport left the Netherlands on 14 May 1940, the day the Dutch army surrendered to Germany. Of the children who joined the transports, some were later reunited with their families, many others discovered after the war that their parents and other close family had been killed. As were many of the children left behind, after the borders closed. I wanted to tell a Kindertransport story this Refugee Week, and so I asked Pauline Levis about her father’s experiences. When 11-year-old Arthur Levi travelled to England with his older sister Inge in 1939, his strongest impressions of the journey were of the warm welcome when they crossed the Dutch border, and the train was boarded by people with flowers and gifts, and of the barrel of biscuits provided on the boat. They were in the unusual situation amongst other children on the Kindertransport, that their father had already arrived here. (He was later interned on the Isle of Man, and then joined the army, where he changed his name from Levi to Levis, for safety should he be captured by the Germans.) Their mother was to follow, six weeks later, the last of the family to make it out of Cologne, and went into domestic service. Both parents lived into their 90s. Members of the wider family were not so fortunate – Arthur’s aunt was deported from France and an uncle from Belgium. His grandfather was long thought to have been killed but it was later discovered that he had in fact died of natural causes in the Jewish old people’s home in Cologne. Arthur and his sister were fortunate in so many ways. They got out in time. They found a safe place, unlike those who fled to territories later occupied by the Nazis. His immediate family escaped too, and so whilst he lived in a series of hostels for refugee children and foster homes, he did have family, and links with his past, beyond the small collection of photographs he brought with him. He always felt lucky, and grateful, and his love for his adopted country was such that after six years living in Australia in the 70s, he felt the need to come back where he belonged. When he was given the chance to participate in the Spielberg Foundation’s Visual History Archive, his daughter Pauline had to work to persuade him that his story was worth telling – he was reluctant because he saw that so many others had lost so much more. Arthur’s family was from Cologne, where they had lived for hundreds of years. His father was a travelling salesman, much of the family had been cattle dealers. Life before the Nazis was not idyllic – his parents’ marriage was turbulent and home life was tense and difficult. Under the Nazis there were some close calls – the Gestapo came for his father just around the time of Kristallnacht, but he’d already left, with the help of his non-Jewish employer. And the old people’s home where his grandfather lived, where many Jewish families had taken refuge in the cellar, was raided, and men and boys over 14 taken away. Arthur had to attend a Jewish school (his own background was secular), where the foreign-born children were targeted first – he remembered the Gestapo arriving, with a list of the Polish children, who were taken away and never seen again. Of Kristallnacht itself he remembered the mix of excitement and fear. Arthur met Edna Gordon, herself the daughter of Lithuanian Jews who’d come to the UK at the beginning of the twentieth century, when he was 21, and they were very happily married for fifty years. He had a successful career as a dental technician, working for many years in the hospital service. He died in 2000, on the anniversary of Kristallnacht, 9 November. The stories Arthur shared with his daughter Pauline shaped her passion for justice, for example in her campaign against the deportation of young Iranian artist Behnam and his family, who were facing imprisonment and torture if they returned, which achieved over 11,0o0 signatures on a petition and ultimately saw the family being granted indefinite leave to remain. His sister’s son and grandson, along with Pauline, are to take part in commemorations leading up to the 75th anniversary of the Kindertransport later this year. I’m immensely grateful to Pauline for sharing her father’s story. (Kindertransport, Before and After: Elegy and Celebration. Sixty Poems 1980–2007 by Lotte Kramer). This entry was posted on June 23, 2013, 7:55 pm and is filed under Genocide, Refugees, Second World War. You can follow any responses to this entry through RSS 2.0. You can leave a response, or trackback from your own site.